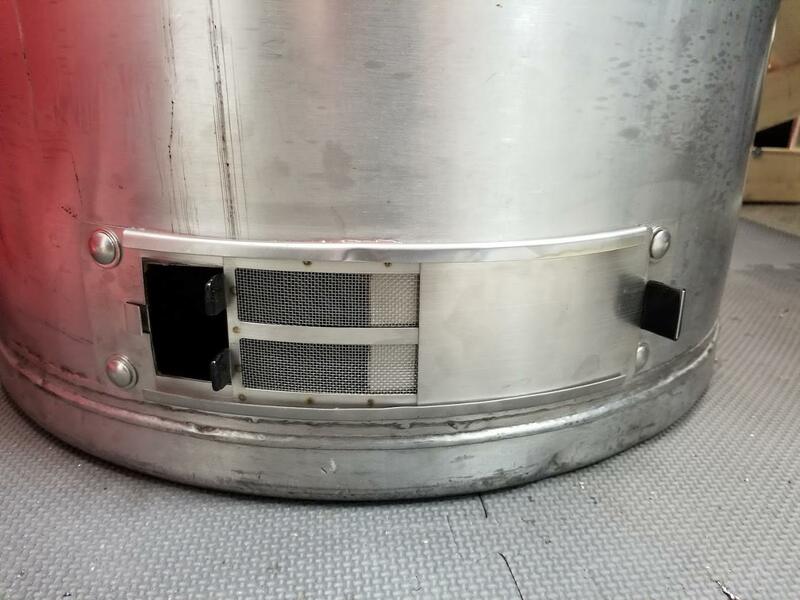 Ugly Drum Smoker - Page 884 - The BBQ BRETHREN FORUMS. LOL Its So bad i am already thinking of my next one! I am looking for the device used to hold the digital meat probe to the UDS. It appears to be stainless Steel and has a pivoting head that that is detachable from the main unit but is attached to the meat probe. Maybe glueing a big HUGE magnet to the bottom of it? One Awesome Ugly Drum Smoker! I have a quick question for those with graphics on your UDS. Did you paint the graphic on or did you use vinyl? If vinyl, how has it held up? I have read this post, twice. 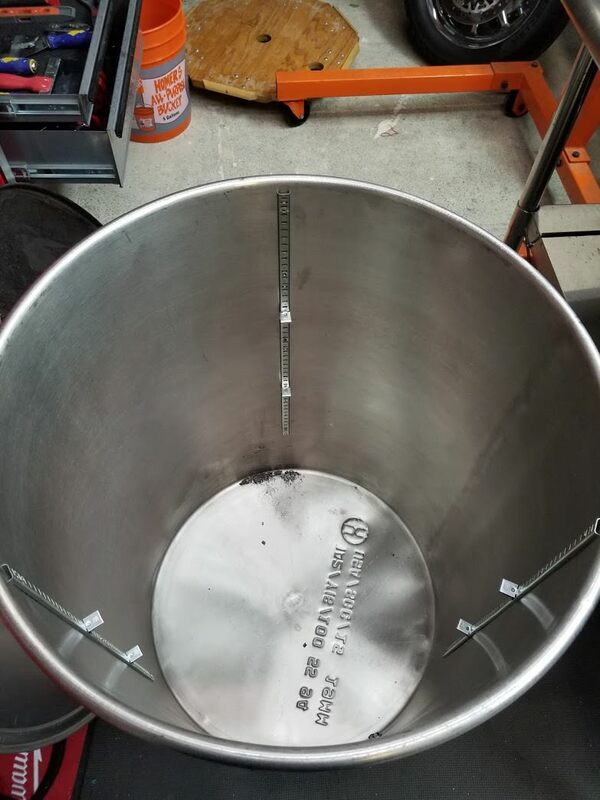 After reading it the first time it was a lot shorter and I built my first UDS. I just got done reading it a second time and finished my second smoker. The 3rd UDS will not require another read, or I hope not. Here is my completed drum. Redskins theme, waiting on a stencil for the center yellow part. I am also going to add a deep fryer thermometer, and a removable table. The small silver shelf is for my ThermPro. The BCF is from a metal trashcan I found on Amazon, 11 holes in the bottom and a 14" grate for the charcoal. Very nice build. I like the thermopro shelf. What's the other metal thing on the barrel? Any Long Island Bros out there? 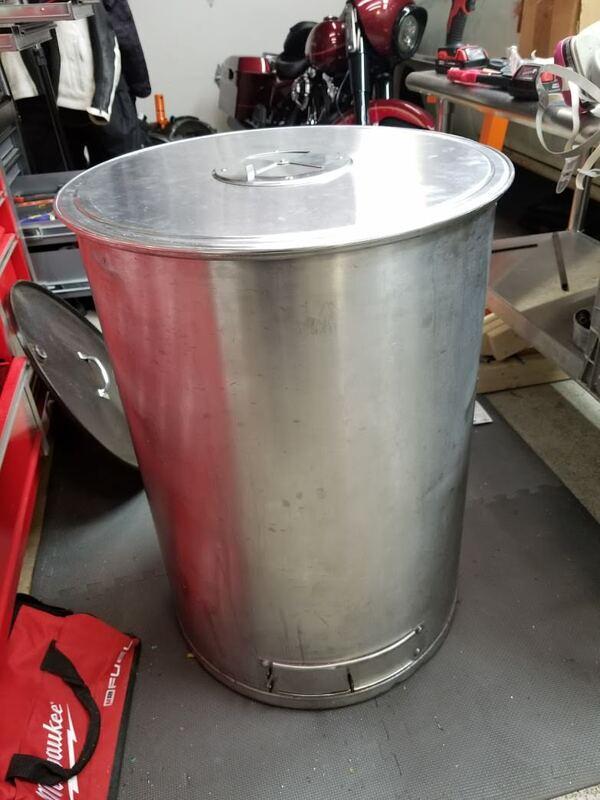 I found a 55 Gal SS drum... $90. I used one years ago and MY DS is awesome... no rust! Drum was a craigslist find, very thick wall, was used for fermenting wine. It was hand made as far as I can tell, several weld beads around the base and a nice thick rolled edge that clips a plastic drum lid perfectly. Conveniently, it also perfectly fits the crust groove in a 24" pizza pan. Used a Amazon BGE replacement vent door. Had to put some muscle in to relax the radius, which ended up crinkling the door lip slightly, but now it just holds the door more firmly. -1 aesthetics, +1 function. Took advantage of the OSH closing clearance to pick up the hardware. I measured the grate size needed to roughly 22 to 22 1/4", so I may have to make my own expanded metal grate (also scored from OSH) Decided to use carriage bolts for the door and stainless rivets for the shelf standards, so everything outside is screw head free and stainless. It's a little dented up, so I guess that's where it gets it's ugly? Wow. What a fine find. I would highly recommend Membersmark to clean the inside. I do mine after every 3-5 cooks and it takes it back to new. I can't imagine how nice stainless would clean up. Thanks for sharing! Built this for a buddy, he's an Iowa State Cyclone fan but his daughter went to the University of Iowa, thus the house divided.